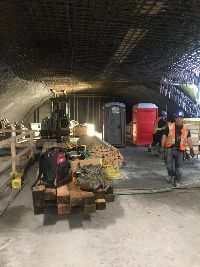 Tunnels - Hardrock Concrete Inc.
With recent technological breakthroughs in shotcrete technology over the past few years, it has enabled this technique to be used in tunneling construction methods national and international. By the very nature of the ‘shotcrete material’, i.e. its ease of application & flexible working process makes it the perfect partner for the lining of tunneling. With any underground engineering project there will be complex geometries in the tunnel which construction companies need to allow for. 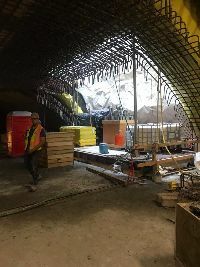 The shotcrete technology & application techniques fit ‘hand in glove’ with these problems. 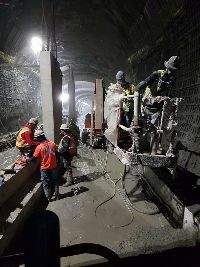 Call Hardrock Concrete today on (416) 710-9930 or (647) 801-9930 to discuss how Structural Shotcrete can effectively be used in your next construction project. Alternatively, please complete our on-line enquiry form and we will contact you. BASF and King are Hardrock Concrete Inc’s preferred suppliers of shotcrete material and equipment. © Copyright 2018 Hardrock Concrete Inc.